Guten tag. Good afternoon. It is my great pleasure to join you at the seminar today. It is great to be back to Hamburg to see some of my German friends again on this occasion since I was last in Hamburg about two years ago. You can see I am wearing the Hamburg badge. 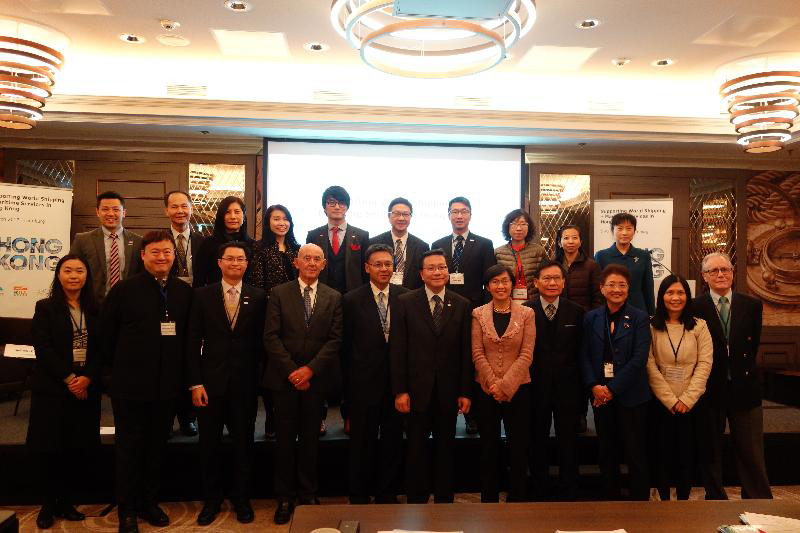 Last time I came in my capacity as the Chairman of the Hong Kong Maritime Industry Council. 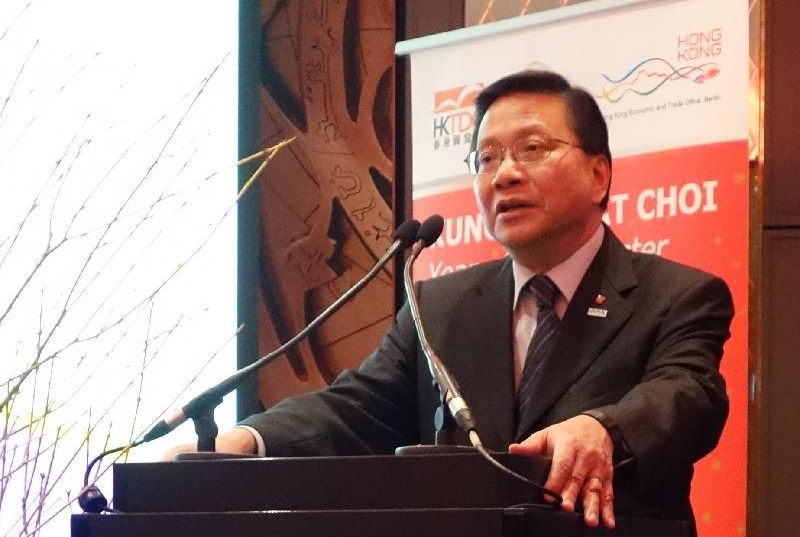 Since then Hong Kong has established in April 2016 the new Maritime and Port Board, which is a top-level body supported by Government to spearhead the enhancement of Hong Kong as an international maritime centre. 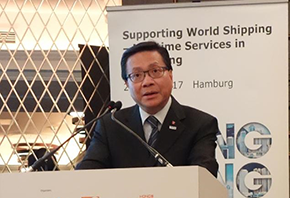 One of our goals is to further develop Hong Kong's high value-added maritime services and establish closer collaboration with other major maritime centres, including Hamburg. Hence this delegation's visit led by me as Chairman of HKMPB. You will agree with me that 2016 was a year of shocks, surprises and "black swans" in the Western Hemisphere. We saw new political dynamics in Europe, and leadership changes in the US. The global economic order has to endure setbacks and confront new uncertainties. Emerging economic nationalism is threatening the prospects of free trade. Comparatively, Asia has been less turbulent and has fared better. IMF (International Monetary Fund) forecasts that the GDP growth of Asia is at 5.3 per cent in 2017, indicating that Asia will continue to be the region with the fastest growth rate worldwide. In 2016, nine of the world's top 10 container ports are in Asia, of which seven are in China, including Hong Kong. China, as the largest economic contributor in the region and the second largest economy in the world (expected to be number one by 2020), is expecting GDP growth at 6.5 per cent in 2017, slower than the past but still robust. What is more, China's grand vision behind the Belt and Road Initiative, covering 60-plus economies along Asia, Africa and Europe, is going to unleash immense economic momentum, in terms of cargo movement, infrastructure construction as well as financial investment. Opportunities often come from uncertainties. Asia and China in the same regard continues to be a region of new opportunities despite the sluggish global shipping market which is bothering many of us in the maritime industry. As a regional maritime hub in Asia, Hong Kong stands ready to be your eyes, ears and hands to facilitate access to the dynamic Chinese and Asian markets, to help navigate the vast shipping business horizons in that part of the world. Our competitive edges are apparent. Apart from our various institutional strengths as an open and efficient economy underpinned by the rule of law, Hong Kong is geographically convenient, superbly well served and located on the Far East trade routes. We are located at the centre of the Asia-Pacific region and a gateway of China, making us a natural bridge - a "super-connector" - connecting the East and the West. Though a city of only over 7 million population, Hong Kong has a vibrant and comprehensive maritime cluster. Members of the Hong Kong Shipowners Association own or manage about 9 per cent of the world's merchant fleet in deadweight tonnage terms. Hong Kong is one of the world's busiest container ports, handling about 19.6 million TEUs last year. The Hong Kong International Airport has been the world's busiest cargo airport since 2010, with throughput amounting to 4.52 million tonnes last year. Currently, there are over 800 maritime companies providing a myriad of professional maritime services, from ship management, broking and chartering, to maritime insurance, finance, legal and arbitration services. The Hong Kong Shipping Register ranks fourth in the world, with some 108 million gross registered tonnage. Ships flying the Hong Kong flag are widely regarded as ships of high quality, as shown by the very low Port State Control detention rate at 0.84 per cent last year, as compared with the world average of 3.57 per cent. Hong Kong is Asia's third largest trading economy in 2015, after the Mainland of China and Japan. Indeed Hong Kong is the world's eighth largest trading economy. In 2016, Hong Kong's total trade reached 884 billion euros. We host about 1 400 regional headquarters and 6 600 regional or local offices of foreign firms. The total number, you can see, is around 8 000. Growing high value-added maritime services is the top priority of the Government's maritime policy agenda. Maritime insurance is one example. 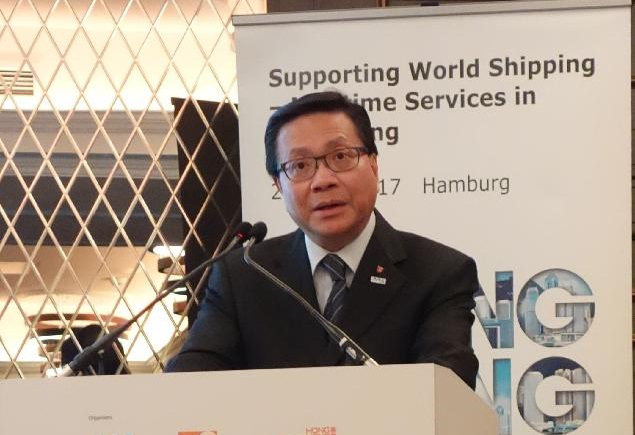 The International Union of Marine Insurance (IUMI) opened its first overseas hub in Hong Kong last October - the first time in the Union's 142-year history that it has a permanent presence outside this city of Hamburg. Tomorrow, the HKMPB delegation will visit IUMI headquarters to discuss, among other things, how best we can make the Asia Hub a centre of excellence for maritime insurance training in Asia. We would also be keen to explore possible co-operation in maritime education and research between our respective tertiary institutions. 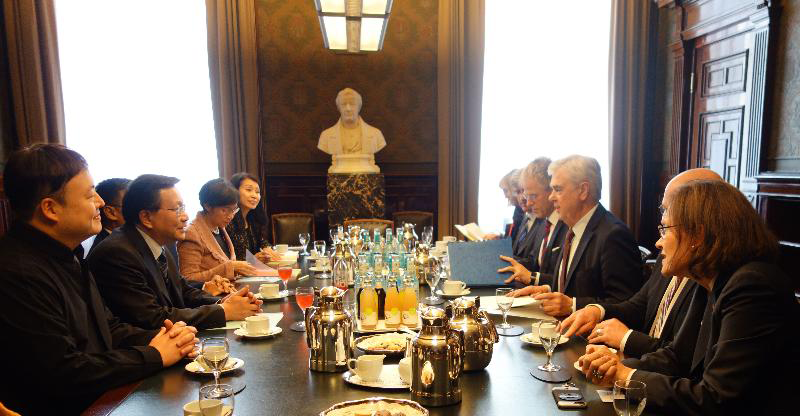 Ladies and gentlemen, Germany and Hong Kong are close trading partners. 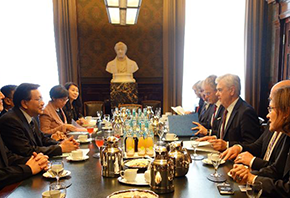 Last year, Germany was Hong Kong's largest trading partner within the European Union. Reciprocally, Hong Kong was Germany's ninth largest trading partner in Asia in 2015. About 360 German companies have operations in Hong Kong and we would like to see more. We encourage more German companies to come to Hong Kong to take advantage of our proximity to the China market and Asia market as a whole. Hamburg and Hong Kong share many similarities. Your city is the gateway to Europe and my city is the gateway to Asia. We both have world-class sea ports that we are proud of. We both serve as the logistics hubs in the regions. We both stand as strategic nodes of the Belt and Road corridors. And we both host a strong cluster of shipowners. But we do share even more, in our core values. We are both dedicated to the rule of law, to free trade, to innovation, and to diversity. Our closer co-operation will bring us more than business, but also the joint driving force of international growth and sustainable development by two outward-looking world cities. On this note, I wish this seminar a great success. 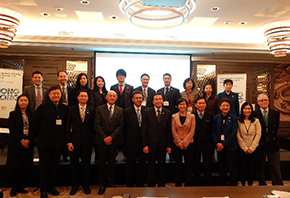 Together we can take advantage of a booming Asia with new business horizons. Thank you. Danke!